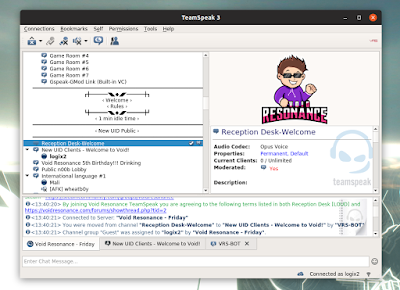 TeamSpeak (client), a popular VoIP application, is now available on Flathub, making it very easy to install on Linux distributions that support Flatpak. TeamSpeak is a proprietary VoIP application for audio communication between users on a chat channel, targeted at gamers. Besides the TeamSpeak client, there's a server as well that can be used to host your own private server. There are TeamSpeak clients available for Windows, macOS, Linux, iOS, and Android, while the server can run on Windows, macOS, Linux, and FreeBSD. The TeamSpeak 3 server is free to use for up to 32 concurrent users, while those needing to serve more users need to purchase a license that varies depending on the number of slots. For a comparison between TeamSpeak and other VoIP software, check out this list on Wikipedia. Though note that some information there is not up to date. For example it says TeamSpeak allows 512 simultaneous users with a non-profit license, but that's no longer the case since September, 2018. To be able to install TeamSpeak from Flathub, you'll need to install Flatpak and add the Flathub repository. You can find instructions for how to do this on the Flathub quick setup page. Linux Mint ships with Flatpak and Flathub by default, so all you have to do is launch the Software Manager application, search for TeamSpeak and install it. On Ubuntu, the Flathub quick setup page mentions adding a PPA. That's for Ubuntu 16.04 and 18.04 only though. Don't add it (skip the first command) on newer Ubuntu versions like 18.10 because there are no packages in that PPA for Ubuntu versions newer than 18.04 (but do follow the rest of instructions). Once that's set up, go to the TeamSpeak Flathub page, and click the Install button. If you're a Gnome user, you can also search for it on Gnome Software / Ubuntu Software and install it from there.